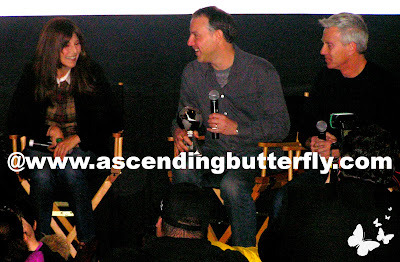 Ascending Butterfly: The Croods + Questions and Answers with Actress Catherine Keener and Directors Chris Sanders and Kirk DeMicco! The Croods + Questions and Answers with Actress Catherine Keener and Directors Chris Sanders and Kirk DeMicco! Da Da Daaaa! 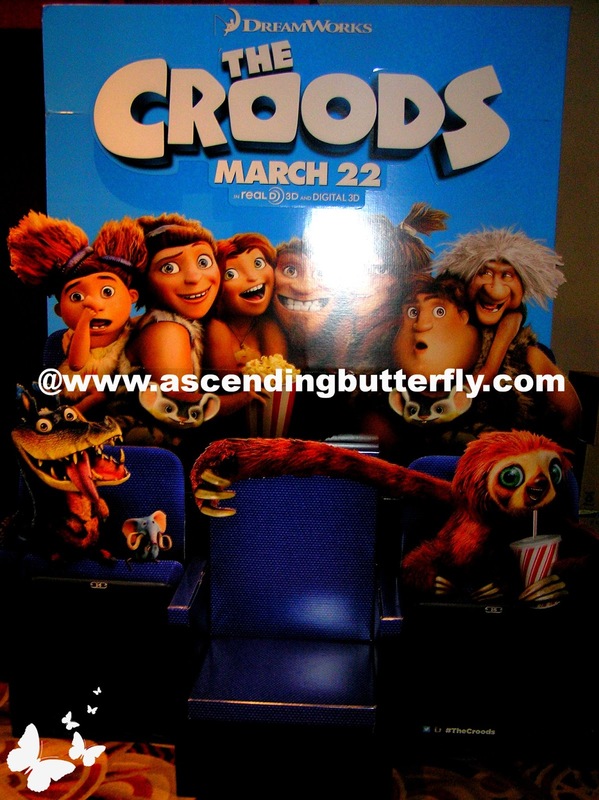 By now I'm sure you've seen the super cute commercials for the upcoming movie The Croods. The Croods tells the story of the world's first family road trip. When their cave is destroyed, the Crood family must embark on a comedy adventure into strange and spectacular territory in search of a new home. As if patriarch Grug (voiced by Nicolas Cage) didn't already have enough to handle, it goes from bad to worse when they encounter an imaginative nomad named Guy (voiced by Ryan Reynolds.) 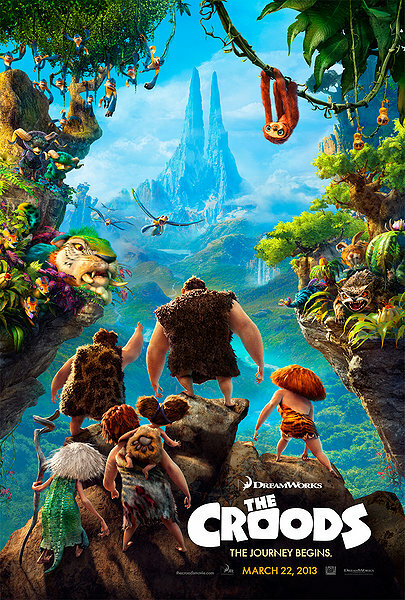 With Guy's help the Croods conquer their fear of the outside world and discover that they have exactly what it takes to survive - each other. 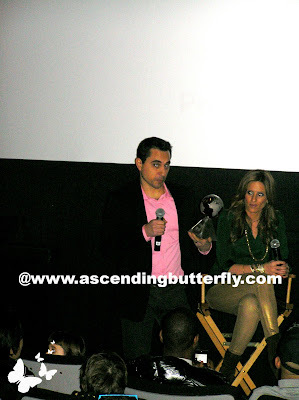 As you know Mamarazzi screenings with The Moms are not your typical movie screenings, they are EVENTS! This screening was followed by a Questions and Answers Session with the films two directors Chris Sanders and Kirk DeMicco as well as Actress Catherine Keener the voice of Ugga who is the family matriarch in DreamWorks animated film The Croods. You know me, I like to take you through the event via photos from begining to end so you can see everything I got to see! Before we got upstairs a very special mascot made his entry in the lobby and caused quite a bit of excitement, it was BELT!!! So when we got upstairs there he was so we could take pictures, and you know I love Mascot photos (as all my photos from most BlogHer Conferences are with the Mascots I find on the exhibitor floor!). My eyes were closed in the first photo above, so thankfully they got another one! Now we're talking! DA DA DAAAAA! I didn't dare sit on that little chair, so I snapped a picture of it! And there was cute Crood branded Popcorn Bags at the ready for us too! 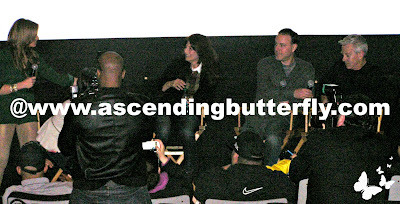 The screening was followed by a Questions and Answers Session led by Denise Albert and Melissa Gerstein the dynamic duo behind The Moms, Catherine Keener the voice of Ugga, and directors Chris Sanders and Kirk DeMicco! Below is a video with Questions and Answers that were asked prior to the audience Q&A but it opens with some of the pre-screening reception and don't blink because I'm in the beginning of this video posing for my picture with Mama Butterfly and Belt! 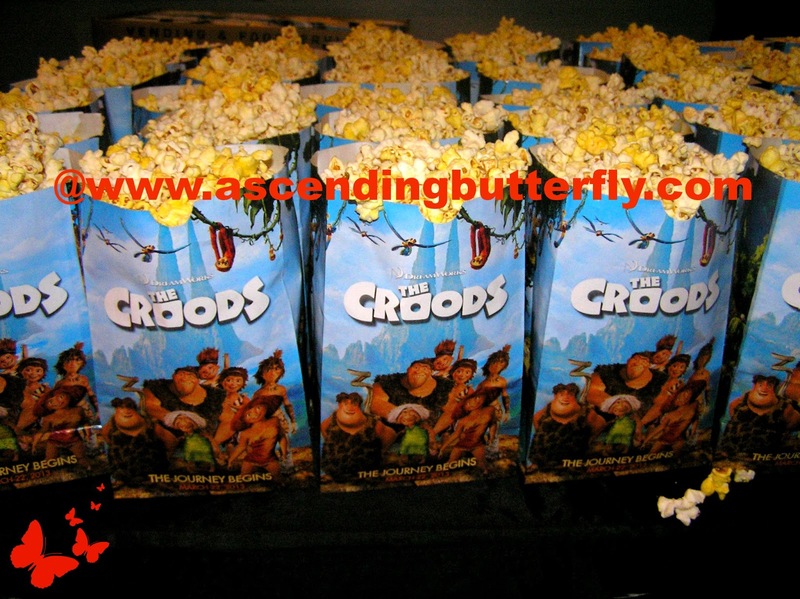 The Croods is good family fun for ALL ages! While I did enjoy Oz The Great Powerful, that movie is definitely for older children and teens, while The Croods is good for all ages. It touches on so many different aspects of what being a family means, and the great lessons they learn along the way when they were forced to embrace change ready or not. Parents learning how to let their children grow and go, and the struggles that children go through when they want more freedom than they may necessarily be quite ready for. The Croods hits theaters on March 22nd and I would definitely say it's a 'Ticket' if you are looking for a family friendly film that is fun for all ages! Once you've had a chance to see it, come back here and let us know what you thought! And Bloggers feel free to link us to your Wordless Wednesday Posts here too! Every weekend my whole family watches a movie together, looking forward to seeing this one! Sounds like a must see, it's great to find a movie that can satisfy the whole family. 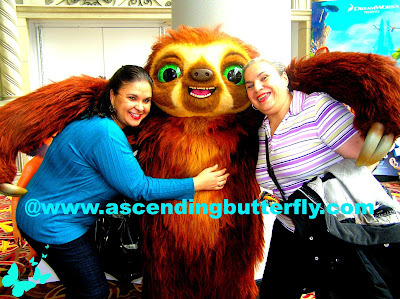 @Big Happy Buddha - The Croods is super fun for all ages! I totally chatted with you by the escalators...lol. I didn't realize it was you. :) Hope to see you soon!